Paris, 1938. As the shadow of war darkens Europe, democratic forces on the Continent struggle against fascism and communism, while in Spain the war has already begun. Alan Furst, whom Vince Flynn has called "the most talented espionage novelist of our generation," now gives us a taut, suspenseful, romantic, and richly rendered novel of spies and secret operatives in Paris and New York, in Warsaw and Odessa, on the eve of World War II. CristiAn Ferrar, a brilliant and handsome Spanish EmigrE, is a lawyer in the Paris office of a prestigious international law firm. Ferrar is approached by the embassy of the Spanish Republic and asked to help a clandestine agency trying desperately to supply weapons to the Republic's beleaguered army--an effort that puts his life at risk in the battle against fascism. Joining Ferrar in this mission is a group of unlikely men and women: idealists and gangsters, arms traders and aristocrats and spies. From shady Paris nightclubs to white-shoe New York law firms, from brothels in Istanbul to the dockyards of Poland, Ferrar and his allies battle the secret agents of Hitler and Franco. And what allies they are: there's Max de Lyon, a former arms merchant now hunted by the Gestapo; the Marquesa Maria Cristina, a beautiful aristocrat with a taste for danger; and the Macedonian Stavros, who grew up "fighting Bulgarian bandits. After that, being a gangster was easy." Then there is Eileen Moore, the American woman Ferrar could never forget. In "Midnight in Europe, " Alan Furst paints a spellbinding portrait of a continent marching into a nightmare--and the heroes and heroines who fought back against the darkness. 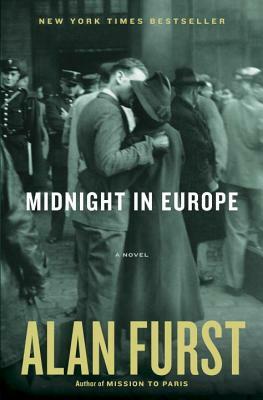 Praise for Alan Furst and "Midnight in Europe"
"Elegant, gripping . . . Furst] remains at the top of his game."" --The New York Times"
"Suspenseful and sophisticated . . . No espionage author, it seems, is better at summoning the shifting moods and emotional atmosphere of Europe before the start of World War II than Alan Furst."" --The Wall Street Journal"
"Too much fun to put down . . . Furst is] a master of the atmospheric thriller."" --The Boston Globe. Alan Furst is widely recognized as the master of the historical spy novel. Now translated into eighteen languages, he is the author of" Night Soldiers, ""Dark Star, The Polish Officer, The World at Night, Red Gold, Kingdom of Shadows, Blood of Victory, Dark Voyage, The Foreign Correspondent, The Spies of Warsaw, Spies of the Balkans, Mission to Paris, "and "Midnight in Europe. """Born in New York, he lived for many years in Paris, and now lives on Long Island.